Butler & Stag will be opening its new branch in Bow next month, a perfect compliment to our existing office in Shoreditch. Well over 12 months in the making, the new office will cover a wide area including Bow, Mile End, Bow Common, Bromley by Bow, Victoria Park, Bethnal Green, Stepney, Shadwell, Limehouse, Westferry and Poplar. Located on the busy thoroughfare that is Roman Road, at the corner of St Stephens Road, directly opposite Roman Road market we've managed to secure a prime position in a rapidly changing main high street. We spent well over a year finding and working towards an agreement for this site and are now in the process of carrying out extensive refurbishment works ready for our grand opening in August. To celebrate the opening on the 17th August we will be offering homeowners an introductory 0% sales and lettings fee for the first three months. 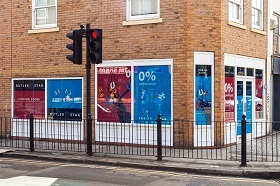 If you'd like to take advantage of our fantastic 0% offer PLEASE CALL 020 8102 1236.